Few historic figures in the rich history of the American frontier are more inextricably linked to the great outdoors than Daniel Boone. A hunting and fishing savant from the time of his early childhood onward, Boone spent his life in a state of perpetual exploration and adventure, continually pushing westward from his birthplace of Pennsylvania before eventually breaching the Cumberland Gap to find the famed “Meadow Land” that the Iroquois Indians called Kentake. While the legends of Daniel Boone—and there many—can be hard to separate from the reality of his day-to-day life, historians unanimously agree that Boone spent much of his formative years hunting, fishing, trapping and exploring in the fertile Yadkin Valley of North Carolina’s Piedmont region. When Boone and his family arrived in the Yadkin in the fall of 1751, they found a pristine landscape complete with fertile soil, bountiful wildlife, high ground for grazing and a wide-mouthed, swift-flowing river capable of powering the grist and sawmills that were so essential to early colonial life. According to Boone biographer Robert Morgan, Daniel Boone and his family may have spent their first North Carolina winter inside a cave by the banks of this river, which took the same name as the valley through which it flowed. The river and the land that surrounded it were nothing short of an unspoiled paradise, especially for a young man infatuated with the outdoors such as Boone. 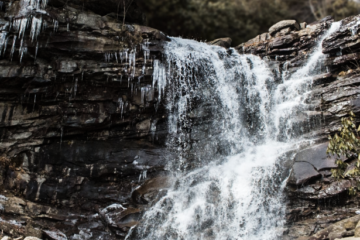 While the Yadkin River of Boone’s youth has changed considerably over the centuries, some of the wild characteristics that drew Boone and other early settlers have remained intact. 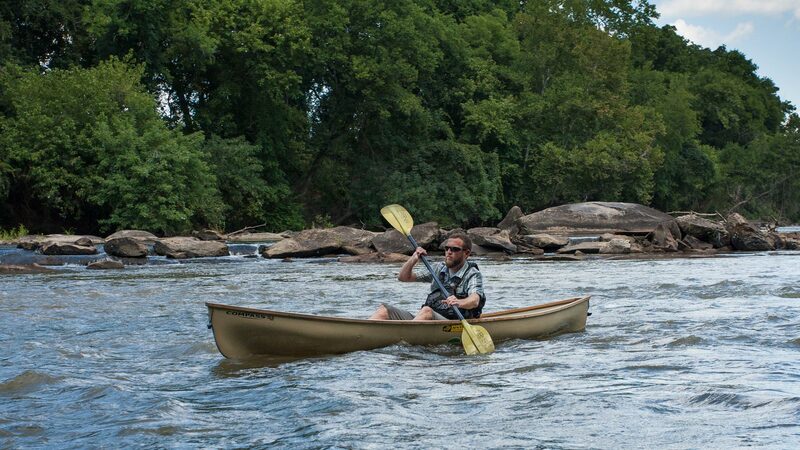 Today, you can experience Boone’s Yadkin for yourself by paddling the Daniel Boone Heritage Canoe Trail, a 22-mile stretch of river that flows through Davidson, Davie and Rowan Counties. Paddlers can put in at the Blueway Put-In off Highway 64 in Lexington. 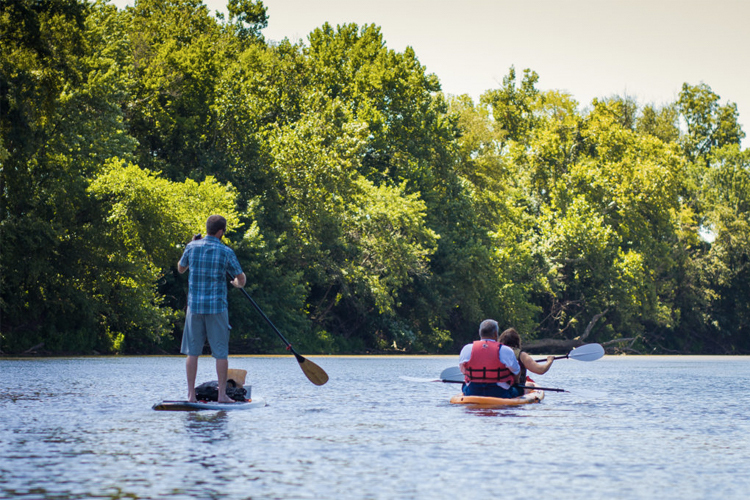 From there you’ll encounter a relatively tame stretch of water and some beautiful scenery beyond the Yadkin’s banks. The trail is dotted with ten historically significant waypoints or cairns that tell the story of Boone’s life on the Yadkin along with the stories of other early settlers and farmers. Cairn number one features class two rapids and marks the spot where Swicegood’s Mill once stood. The rapids here are created by the remnants of a large stone structure built in the 1800s by the Army Corps of Engineers. The structure, which was subsequently abandoned, was built in an effort to establish steamboat navigation along the Yadkin. Today it marks the best whitewater feature on the entire Daniel Boone Heritage Canoe Trail. Cairn number two pays homage to North Carolina’s history as a tobacco farming hub, marking the spot where Hairston’s Ferry used to stand. With an extensive system of some 40 tobacco plantations, the Hairstons were some of the most renowned tobacco farmers in North Carolina and Virginia. It was from this location on the Yadkin that the Hairstons ferried their wares across the Yadkin. Cairn three brings the paddler back Daniel Boone’s infamous time on the Yadkin, marking a spot where he is believed to have spent time fishing during his youth. Boone’s Shoal-Big Rock Rapid, located just upriver from Dutchman’s Creek, features a large ledge with a very large boulder in the center. It makes for a great lunch stop and a fun class I drop. The next cairn brings paddlers of the Boone Trail to a Yadkin tributary known as Dutchmen’s Creek. This creek is significant because it leads up to a homesite where newlyweds Daniel and Rebecca Boone once lived. Cairn number five marks a spot known as the Boone Gamelands. Here, modern day sportsmen can pursue wildlife on the same ground that Daniel Boone himself once hunted. 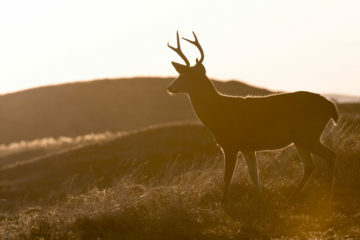 The Boone Gamelands are administered by the North Carolina Wildlife Commission. Beyond Dutchmen’s Creek and the Boone Gamelands is cairn six where you’ll find Boone’s Cave Park. This park contains a fairly large cave that sits on a bluff above the Yadkin River. According to local lore, Boone visited this cave frequently as a youngster. It is important that paddlers do not attempt to disembark at cairn 6. Instead, continue 450 yards downriver to Baptism Rock Access. 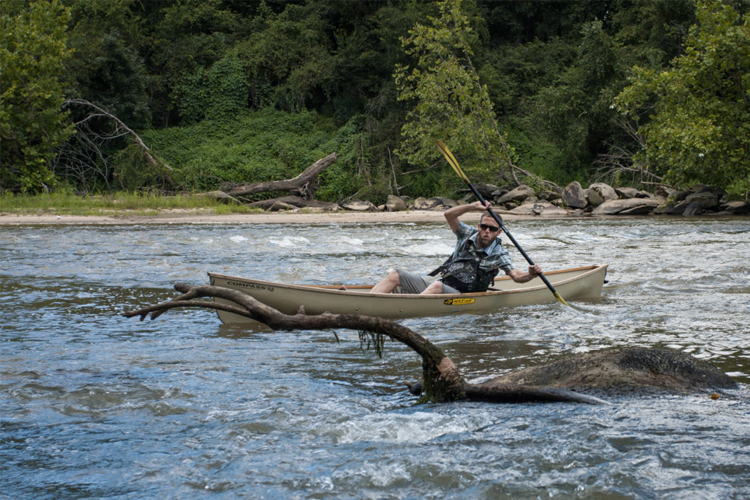 Cairn seven brings paddlers to a location on the Yadkin known as Boone’s Ford. It is unclear whether Boone’s Ford is named for Daniel Boone himself or for another member of his family who settled in the area, but most agree that it marks the spot where an old Indian trading road once crossed the Yadkin River. Cairn number eight marks the spot of yet another ferry, this one known as Hannah’s Ferry. According to local knowledge, Hannah’s Ferry was an example of a reaction ferry, an ingenious design whereby the ferry boat relied solely upon the river’s current to power the boar back and forth across the river. Cairns nine and ten mark the section of the river where the Boone’s Heritage Canoe Trail comes to an end a and the High Rock Lake hydroelectric reservoir begins. 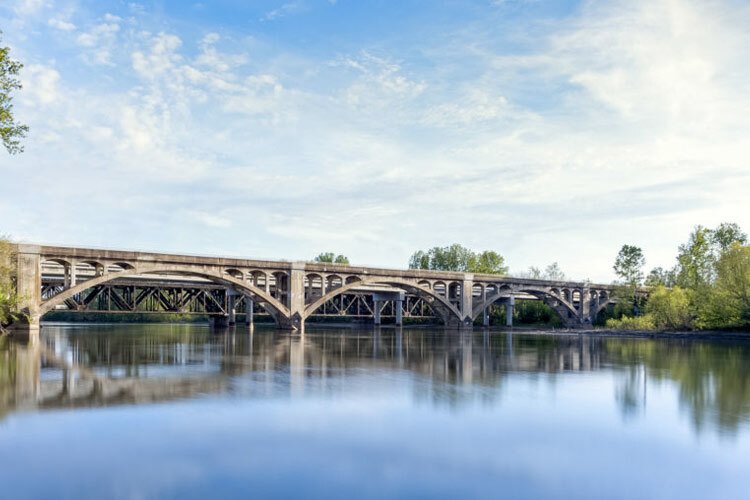 Before you reach the lake you’ll paddle past bluffs, bottomland forest and the remnants of Beard’s Bridge, a covered toll bridge built in 1818 that offered area traveler’s their first means of permanent passage across the Yadkin River. Once you’ve paddled all 22-miles of the Daniel Boone Heritage Canoe Trail, you’re bound to be craving refreshments. Luckily, nearby Lexington is a veritable Mecca for North Carolina-style barbecue. When it comes to choosing a barbecue joint in Lexington, you’ll want to keep your options open because this historic barbecue hub is home to more than a dozen with names like Backcountry Barbecue, The Barbecue Center, Cook’s Barbecue, Kerley’s Barbecue and Lexington Barbecue.